Ball joints. You know, back in the days my pops would refer to them in a pretty fitting way. Just as our hips wouldn’t move without our hip joints, a car is done for without a well-functioning ball joint, he’d say. Makes perfect sense! A worn out ball joint means trouble for your vehicle’s steering and suspension. You won’t be safe when driving that car! You can fix things up with the proper tools, but I wouldn’t say there’s a one and only best ball joint press kit. It mostly depends on whether you’re a DIY fan or are aspiring to become an auto mechanic. For general use and basic needs, I’d recommend you this Astro kit. It comes with a decent C-frame press, receiver tubes and usual adapters. A bonus are the custom drive adapters for 4WD vehicles. However, you might want something fully manufactured in the US. 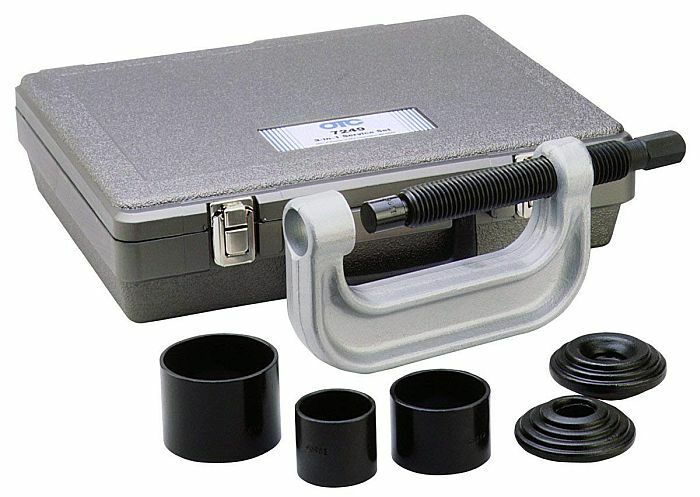 In this case, you can swap the Astro for this OTC ball joint tool kit. Its clamp is extra strong, and honestly – the carrying case is more durable and looks way better. Be careful, though: you won’t receive 4WD drivers. If you’re a budding auto mechanic, these won’t cut it. Alltrade have a gigantic 23-tool ball joint press set with receiving tubes and cups in various sizes. An overall fair price considering how much versatility it offers compared to more basic ball joint removers. Let me head over to the reviews so you can have more information at your hands. After all, how else would you make an informed decision? Astro Pneumatic Tool manufacture affordable tools with stellar performance. No, you won’t get the WOW! factor here. However, for its price this is a pretty darn good kit. The important bonus here are the 4WD adapters. For trucks or, say, bigger Dodge vehicles, you will need them. Many other basic sets don’t include these which is a shame in my opinion. Oh, yeah. You know I’m a fan of Jeep. So those special adapters apply if you want to be tinkering around with Jeep ball joints too. All in all, a good kit. You should be good to go with it, and without even shelling out too much cash. Quite a few people prefer to see local manufactures if it’s about tools they’ll need often. Can’t argue with that, and I myself prefer production in local facilities. OTC are proudly Made in USA as you should be able to see on the kit when you receive it. You get a more durable C-frame press that should last you for years ahead. All in all, an improvement over the Astro set for ball joint removal. Yet there’s one drawback: as I mentioned, you don’t get the custom adapters for 4WD/bigger vehicles. Keep that in mind if you have a monstrous pal in your garage. Not 12, not 15, but a whole lot of 23 pieces in that gigantic kit! No matter what vehicle you’ll deal with, you’ll be more than prepared. Not only this, but the tools here can also be used to remove or install U joints. Which is exactly why I’d recommend this for mechanics/contractors starting out. This is a pro set, with both the manufacture quality and wide array of tools needed for a Job Well Done. Of course, if you fix your buddies’ cars as a hobby – well, then this fella will be your new trusty sidekick. A note on the C clamp: it’s tough. Like, really, really tough. Definitely tougher than the Astro one, and on par with the OTC US manufacture. Without a doubt, the best benefit here are all the receiver tubes. I won’t list them all – just rest assured that no matter the vehicle you’ll be prepared to deal with its ball joints. Or U joints, for that matter. Alltrade’s fantastic ball joint kit has got you covered! Wait, do I really need to buy a kit to do that? As long as you’re not Hercules – yes, definitely. There’s no other way. Ball joints are glued together (read: fit) very tightly. If you want to put them apart, you need to apply extreme pressure. Otherwise they just won’t disassemble. By the way, this is also why you want to get a nicely manufactured clamp a.k.a. C-framed press. You’ll be sticking your head down there. I assure you you won’t be happy if the press bends and parts of it shatter around you. OK, OK – but how do I change a ball joint? Once again, similar to other auto guides I’ve written I’ll stick to the tried formula. Here’s what I think is the best Youtube video for you DIY fellas. The guy uses a set with more receiver tubes than most basic kits, but that doesn’t matter. What matters is that he explains things thoroughly. Enjoy it! If you’re curious about some more car-related guides, I should have you covered…Well, to some extent, of course. Be sure to check out my thoughts on various shocks & struts manufacturers. For example, here’s my KYB vs Monroe guide, and I have some thoughts on Bilstein shocks too. For Jeep owners – we know how important batteries are. Here’s what I think of two leading Jeep battery manufacturers.